For patients who have excessive gum tissue, the teeth can often appear stubby. What you may not know, however, is that beneath that overgrown soft tissue, your teeth are just waiting to be revealed! 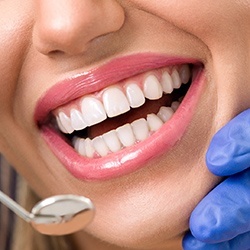 If you have a gummy smile, we may recommend a gum lift, otherwise known as a gingivectomy. This simple cosmetic procedure can be performed by soft tissue laser, Electrosurge, or traditional surgery. We'll talk with you about your options and what to expect during the procedure, then discuss the outcome you want to achieve. The day of your procedure, we'll mark your gum tissue, make sure that you're comfortable with anesthesia or sedation, and then precisely remove the excess soft tissue. After a brief recovery, your new smile will look bold, beautiful, better than you ever thought possible!